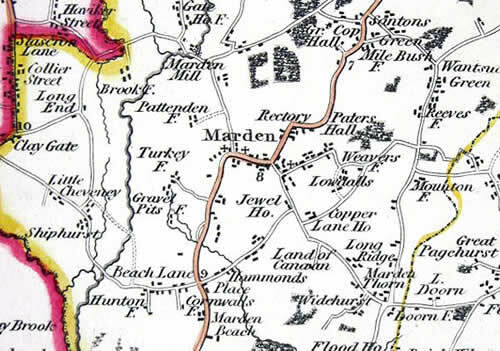 A modern map “The Dens of Marden”, drawn by Bob Highwood of Marden, shows their positions. 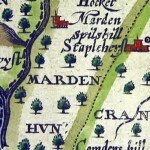 The first large scale map of Kent map published in 1569 by Philip Symonson. 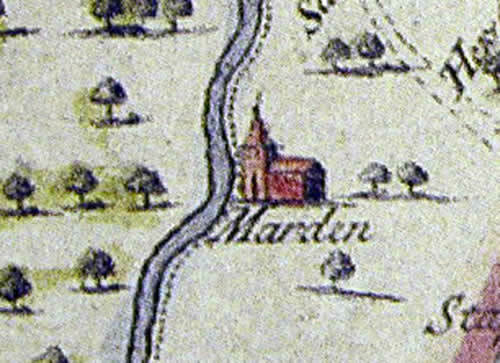 All show Marden as little more than the Church surrounded by woods. 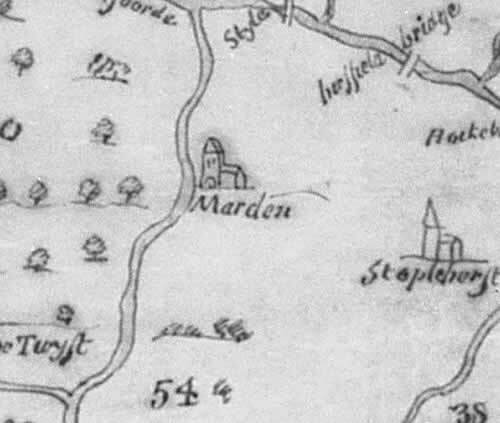 However as time goes on much more detail appears. 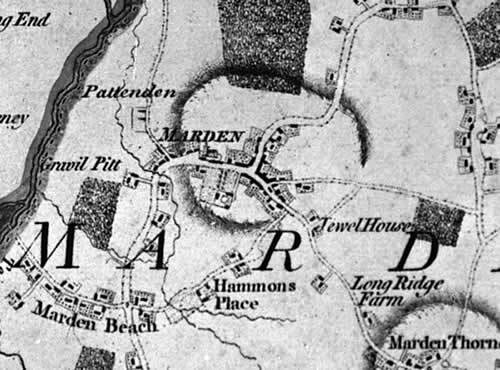 The pattern of roads begins to look familiar today, and dwellings are shown as well as outlying areas like Marden Beech and Marden Thorn. 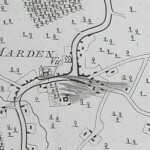 By the end 18th Century the Military were mapping the country and details of fields began to appear. 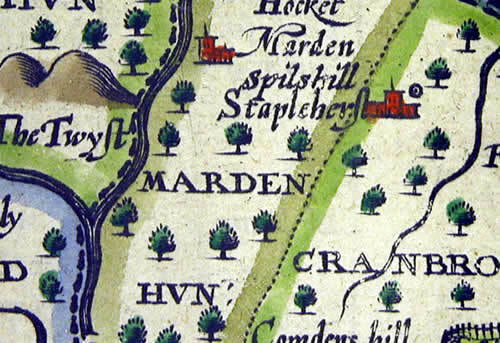 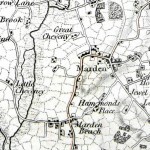 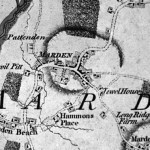 A Map of the Hundred of Marden first published in 1778 by Hasted shows the Vicarage. 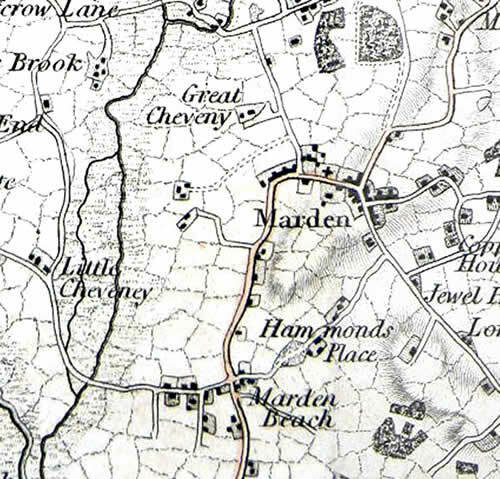 More detail of the surrounding farms was shown in a map which is probably by Christopher and John Greenwood, first published in 1821. 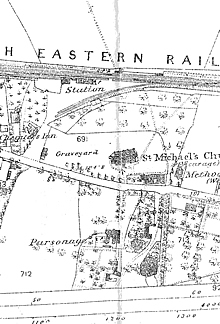 Finally a map of 1866 shows the arrival of the railway, the station, and Railway Cottages. 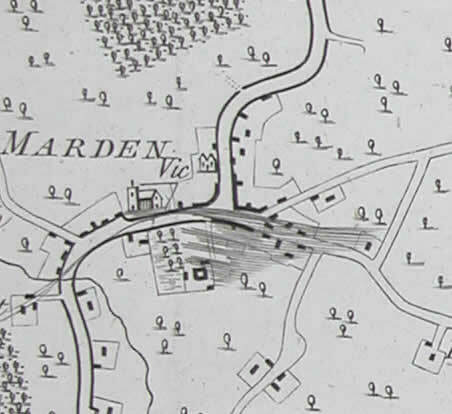 However, interestingly, it still shows the turnpikes (TP) at the Maidstone Road and Pattenden Lane. 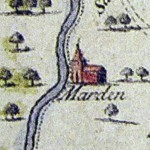 The Church has been supplemented by the Wesleyan Chapel and the Congregational Church (Independent Church) and there is a Parsonage opposite the graveyard, as well as the Vicarage in Maidstone Road. 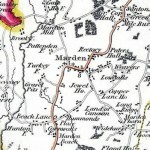 The Post Office was at the corner of Maidstone Road and the High Street. 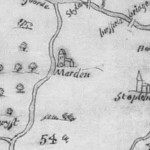 The circle of the Cockpit can be clearly seen though it is not marked.